Recently Adam Machanic (b/t) was telling me about an interesting effect of the top operator. When I asked for an example he pointed me to a few of his sessions from various Pass Summits. They are amazing and I recommend watching them, but they also lead me to something called PassTV on youtube. I’ve heard of PassTV before but never really taken advantage of it. It is of course sponsered by Pass (the organization formerly known as the Professional Association for SQL Server), a group devoted to spreading the joy that is SQL Server. They provide a ton of free training. 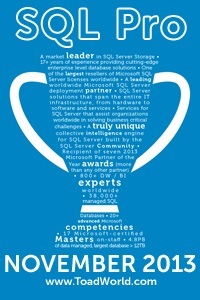 A great way to get some free training and network with others who share your passion for data and SQL Server. A free day of training coming to a city near you. A solid 24 hours of free training. Well a number of these great sessions are saved for posterity on youtube under PassTV. If you follow the link and look under the playlists you will find, among others, the best of Pass Summit 2014, 24 Hours of Pass 2014 and Pass BAC 2015. For future reference I’ve added the link for PassTV to my Study and Reference Materials page. The government was shutdown during PASS Summit 2013 and I was sitting at home not getting paid (contractors were not paid retroactively), so I watched PASS TV in real time each day. Based on the quality of the the presentations, I decided to sign up for SQL Saturday in DC and join the local user group. I had attended two Microsoft conferences (TechEd and Office Developer Conference), but I thought the Summit sessions were much better than most of what I saw there (especially Grant, Paul and Kim). That’s awesome! I’ve seen Grant speak a couple of times and always enjoy it. Hoping to see Paul and Kim speak at some point. I’ve listened to their MCM training videos but it’s not quite the same.